The unique physical properties of Rhino make it the ideal protective barrier against corrosion, impact, abrasion and premature wear and tear. Our resilient, 100% solids formulations bond directly to virtually any surface and provide a thick seal against air and moisture, regardless of temperature extremes. Rhino Linings protects your trucks, fleet vehicles and RV’s, bumper-to-bumper, roof-to-chassis with the best spray-on linings in the business. 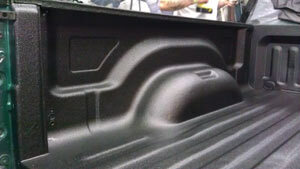 We offer the #1 consumer rated spray-on truck bed liner. 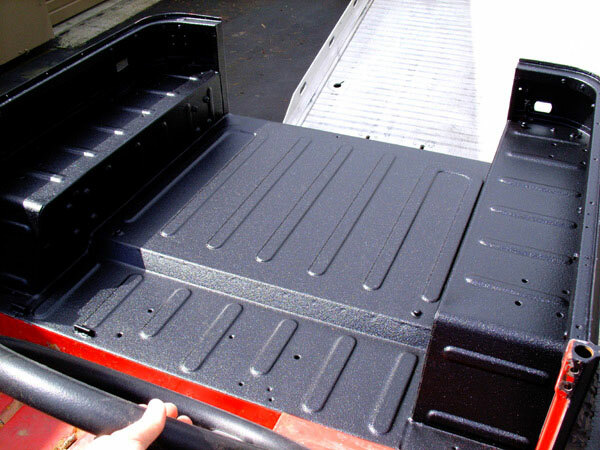 Drop-in Bed Liners might look custom, but they allow water and debris to slip between the liner and the bed, dramatically reducing the lifespan of your truck. Most other spray-on liners are literally half as good as Rhino Linings. Our coatings are 1/8th of an inch thick, as compared to the industry standard of 1/16th of an inch. How big of a difference is that? Plenty. Rhino Linings are scratch proof, slip-proof and dent resistant. No alternative has the grip of Rhino Linings. Prevent damage your cargo, cabin and gate by keeping everything you haul in its place. #1: Fix It–Before we begin, our body shop can pound out minor dents and repair small holes. We don’t use harsh, toxic chemicals to etch the bed; we abrade with hand held machines. This process allows Rhino Linings to take an instant hold. 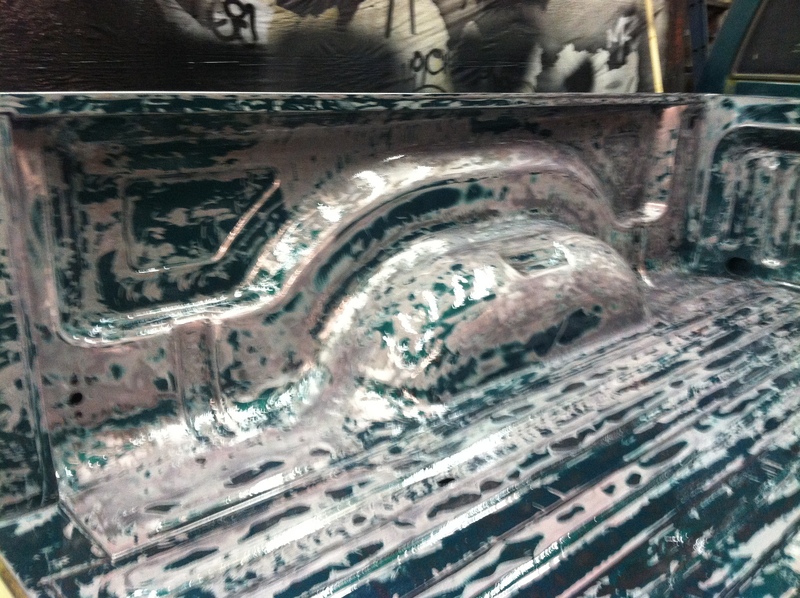 #2:Mask It– One of the most important steps in the spraying process. By taking the time and detail into masking off the truck right we eliminate any possibility of over spray. #3: Clean It–High compression air blows out dust, material and debris so that nothing comes between the liner and the steel. A non-toxic acetone wash removes all micro particles. #4: Spray it–Your Rhino Linings product is applied using a 160-degree, high-pressure spray. Our specialists make laser-perfect lines with pinstripe precision. All natural drainage holes are kept open. We only have — and need — one chance to get it right. Rhino Linings sets in 10 seconds. #5: Cure It–Finally, we apply the UV topcoat and let it dry. Four hours. Start to finish and you’re ready to go. If someone else promises you a faster installation, they are compromising quality. Invest four hours with us and your truck bed lining will last for the life of your truck. If you’re constantly worried about nicks and dings, you won’t enjoy driving your truck and you’ll never realize its total performance potential. Give your truck complete corrosion, impact and abrasion resistance with custom Rhino Linings sprays on your grill guards, bumpers, and rocker panels. Go for a sharp two-tone look with a factory black lining — or color match your truck’s finish and add a UV topcoat. Cargo, weather and debris — your truck takes a beating from all angles. Just like you, it needs to keep working, no matter how tough the job. The terrain may be tough…but Rhino Linings® coating is tougher. Protect your investment by lining your Jeep® tub, rocker panels, fender flares, grille, hardtop and more with Rhino Linings solutions.